The Winter quarter of toddler material is entitled God’s Son. This quarter covers the birth and early years of Jesus. Students will learn how to “sight read” the word “Jesus” using different activities and teaching methods. Many new vocabulary words will be added to their repertoire, such as message, hay, and manger. 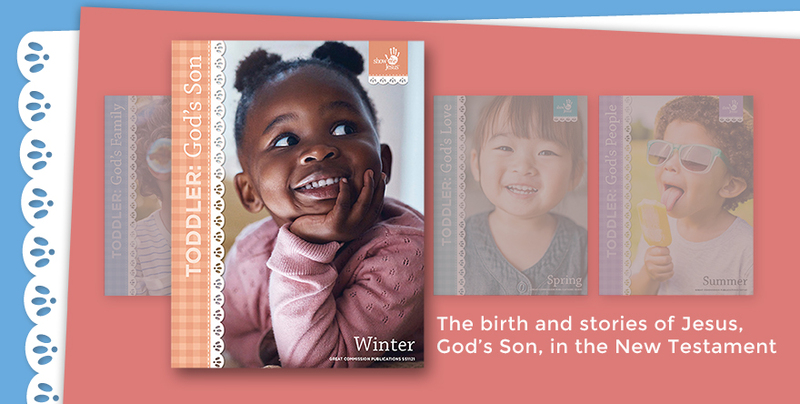 Although toddlers are limited in their vocabulary and understanding, they are able to learn some Bible stories and grasp some basic Bible truths. The goal of this curriculum is to provide these little ones with a firm biblical foundation for the coming years. Most importantly, in every lesson they are pointed to Jesus and their need for him. The Winter quarter of toddler material is entitled God’s Son. This quarter covers the birth and early years of Jesus. The average vocabulary of a 2-year-old is 200 words. This grows to 1,500 words during the third year. An important key to teaching Bible truths to this age is through the music they sing. The toddler curriculum is foundational in the Show Me Jesus Sunday school material. © COPYRIGHT 2019 GREAT COMMISSION PUBLICATIONS, 3640 WINDSOR PARK DRIVE, SUWANEE, GA 30024-3897.